Has the ability to look into the future ever been something that has peaked your curiosity? Have you ever wondered if the people that you’ve seen analyzing someone’s destiny by reading their palms, are even for real? Do you often ponder whether or not something like this could even be done? Well, if you’ve answered "yes" to any one of these questions, then you have arrived at the right place. Before we go any further, I think you should know exactly who I am. 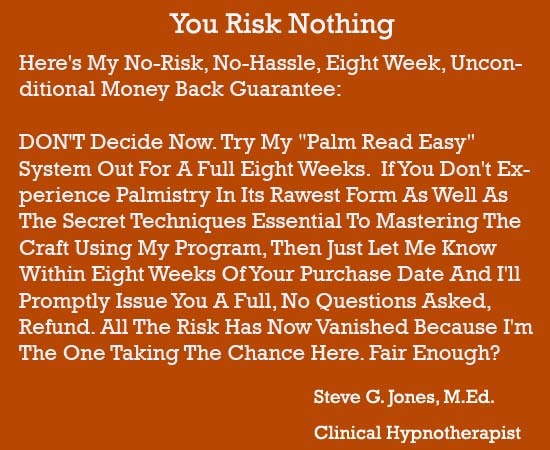 My name is Steve G. Jones, Clinical Hypnotherapist, and for the past 25 years I have been helping people create powerful, lasting change to positively impact their lives in various areas, using the power of hypnosis. Hypnosis and the methods by which the mind works have always fascinated me; I guess that’s the reason I spent so much time investing in an education in psychology. Years before I earned my doctorate in education, I was in a classroom studying all the prerequisites needed for me to achieve my educational goals. And while things like psychology interested me, it was the study of metaphysical subject matter that really fascinated me. Things like numerology, astrology and auras were things I truly enjoyed learning about. Then one day I came across what we know as palmistry, the practice of reading one’s palm to learn about their destiny in life. Now at first, I was astounded by the fact that something like this could even be done, but then I asked myself what the point would be in discovering someone’s destiny if it could not be changed? That’s both boring and scary if you ask me. Nevertheless, I decided to explore palmistry anyway and see if it was something I was misinterpreting. And as it turned out, I was. Once I learned the secret to why palmistry wasn’t what I thought it was and that it could have a profound impact on how one’s future played out, that’s when I really started delving into it. I read as many books as I could get my hands on, often cross referencing what I had learned in each book to see if there was any conflicting information. I began to sift through all of the information that I was exposing myself to and just like anything else, started realizing which information was relevant and which was bogus. Now, I realize that not everyone has years to invest in mastering a craft through countless episodes of trial and error so I decided that I would take all of my knowledge and create one simple, comprehensive resource that anyone could use to learn and master palmistry all within the same day! That’s right, not only will this program teach you about palmistry, but you will be able to apply what you learn all within a few hours. Line Interpretation - Learn the major lines of the palm including the heart, life, head, trident and destiny lines and how to interpret the meaning that each one holds. Foretelling Mastery - Discover what the future holds for yourself as well as others. Major Hand vs. Minor Hand – Learn the difference between a person’s hands, what it means, and why it's so important. Palm Destiny - Learn your destiny according to your palm and why the left is so much different than the right. 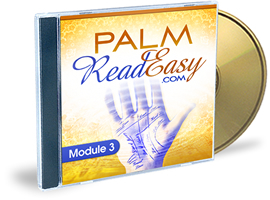 Real Life Application - Learn how to apply what you learn from palm reading into your own life to gain further enrichment. Redirect Signals - Learn to give advice to others based on what you see and how it can affect their destiny. Don’t wait any longer, take action today and begin to open the window to your destiny. P.S. – Remember you have absolutely nothing to lose because you can try the program for a full 8 weeks before deciding whether or not you want to keep it. P.P.S. – This program will enable you to see the future before it unfolds by transforming you to a master of palmistry all within just a few hours of learning about it.